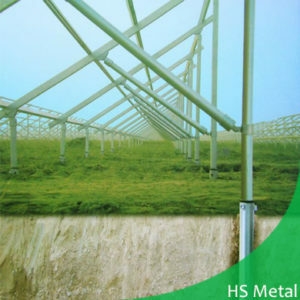 As part of photovoltaic industry chain, PV mounting structure has not been considered as high end atmospheric grade, but this seemingly simple, no technology products indeed contains a lot of important points. As PV mounting structure supplier, we will address all aspects of PV mounting structure, hope to share and communicate with all. It refers to structures that install and fix solar modules. According to different photovoltaic application, mounting structure is classified into residential, utility and power plant usage. No matter how to classify, PV mounting structure ultimate purpose is to solve two problems: solar panel and tracks fixed connection, tracks and base (grounding or roofing) fixed connection, and ensure its reliability. Here note: what refers to mounting structure are usual products, simply as the fixed part of photovoltaic power generation system. To achieve better effect, photovoltaic power generation system can be functional extended, such as BIPV, carport, pergola etc which are not in this scope. The PV mounting structure as the fixed part of photovoltaic system must ensure its reliability during the period of validity of the photovoltaic system. Generally, component service life can be up to 25 years, namely the mounting structure must be guaranteed for the period of validity of the photovoltaic power generation: safety, applicability, and durability. Applicability is presented by system rigidity: control on the deflection deformation of the system during the reasonable life. Durability is presented by endurance from time view, such as: surface oxidation resistance, corrosion resistance etc. To guarantee the reliability of the PV mounting structure, it needs to understand the material standard, mechanics of materials and structural mechanics. Modern design basically use finite element analysis, common used software like: PKPM, SAP2000, ANSYS etc. For aluminum alloy, it’s necessary to design installation, supporting parts and fittings. Installation shall be featured with simple structure and fast installation. The design of the support and fittings need to meet the requirements of strength, rigidity and durability. Carbon steel mainly adopts the standard sections and standard part on the market. 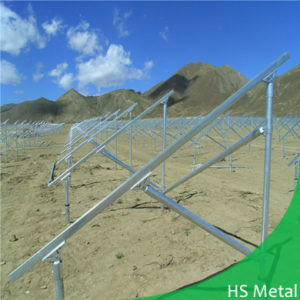 We also produce ground screw for solar PV installs.